I have a GARGANTUAN sweet tooth. It was a big contributor to my previously obese state. It turns out that as you lose weight, that sweet tooth is not shed with the pounds. I’m constantly searching for healthified desserts. This one is pretty freaking awesome if you like blueberries and the texture of custard. I think it could be made with egg whites rather than whole eggs, if one was to desire to reduce the fat content even further. 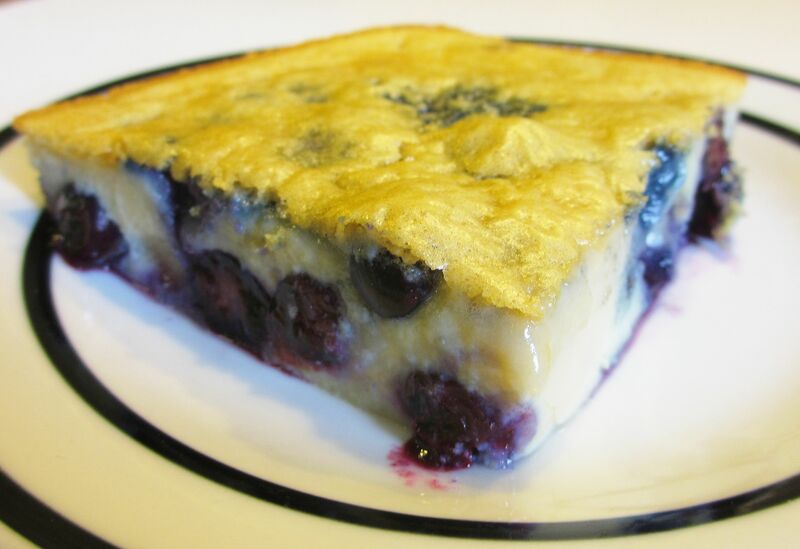 Clafoutis is a French dessert, traditionally made with cherries. This one has be modified to be considerably healthier than the French original – no sugar, flour, cream, or butter- but still delicious! 1. Preheat over to 300°F. 4. Add eggs and water. Use mixer to ensure ingredients are smoothly mixed. 5. Add vanilla extract and maple extract. Mix thoroughly. 6. Pour batter into casserole dish. 7. Drop berries in evenly in batter. 8. Cook for 40-50 minutes until center of batter become solid.